X marks the spot. Hollywood Boulevard, circa 1977. City of Angels, city of mohawked ghosts. A raucous and rockabilly punk band—yes, rockabilly punk bank—is formed. John Doe. Exene Cervenka. Billy Zoom. D.J. Bonebrake. Their first album would be unleashed three years later. Its title, Los Angeles, pays tribute to the west coast home turf edition of the exploding punk scene, a neck of the woods home to heavyweight punkers like Black Flag, The Germs and The Screamers. They are the ghosts of punk past. Speaking of ghosts, I envision the spirit of Jim Morrison hovering up in the rafters at an X show at Whisky a Go Go—the old haunt where The Doors once graced the stage as house band—if for no other reason than to check up on his old friend Ray Manzarek, who produced the first four X albums while also lending a heavy dose of his own Doors-y keyboards to their debut. The connection between The Doors and X didn’t stop with Manzarek or the Whiskey either. Like The Doors, X was a group of individuals who each brought something unique to the table and were able to forge a distinct new sound out of the marriage of seemingly disconnected genres. These were two bands that had unique visions, refusing to be boxed into the corner of any one scene. While The Doors broke on through from rock and roll with their own fusion of, among other things, classical music, hard blues, and psychedelic rock, X managed to stay ahead of the three-chord punk curve by infiltrating its template with throwback rock and roll riffs mixed with a rockabilly aesthetic served up Zoom-Doe style. What’s more, both bands were not afraid of laying down some serious poetry. Put it all together, and it’s not too hard to see why Manzarek would feel a certain kinship to this band of genre-bending vagabonds, and visa-versa, why X would feel a bond to the ghosts of Doors past. 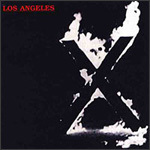 Coincidentally, X would pay tribute to the connection by delivering a punked-out version of “Soul Kitchen” on Los Angeles. When it comes to debuts, just how often do bands hit the floor running full bore? It seems like the typical trajectory is that groups do not find their real voice—that perfectly honed sound—until time gives way to experience and experimentation. More often than not, they get their sea legs a few records into the game. Not so for X. This was a band that, straight away, got it exactly right. Los Angeles was polished and fully realized. This story was similar, in fact, to a certain self-titled debut by The Doors. These bands both rewrote the script. And for proof that it was no fluke, X would do it again on their second release, Wild Gift, and again on the next two still. Dragster beginnings like this are certainly worth celebrating. Fast forward. The original members of X continue to tour sporadically, still finding ways to tap into the energy of their manic beginnings. I caught up with them in Chicago in 2001 at House of Blues and sure glad I did. It remains up there among the best shows I’ve ever experienced. I can’t say I dance all that often, but I’ll be damned if I could keep my feet on the ground that night. Not sure if I pogo’d or what you’d even begin to call it. Didn’t matter just like It didn’t matter what year it was or what city I was in. The spirit of punk rock was alive and well.